Gosh I am so tired of the rain. It has drizzled for days and been gray and miserable. Oh well, it has kept me busy working inside and I am getting lots done for a change. Even so, it snowed about three hours from Houston. That, my friends, is a very exciting thing in South Texas! TV is showing kids sledding in laundry baskets. 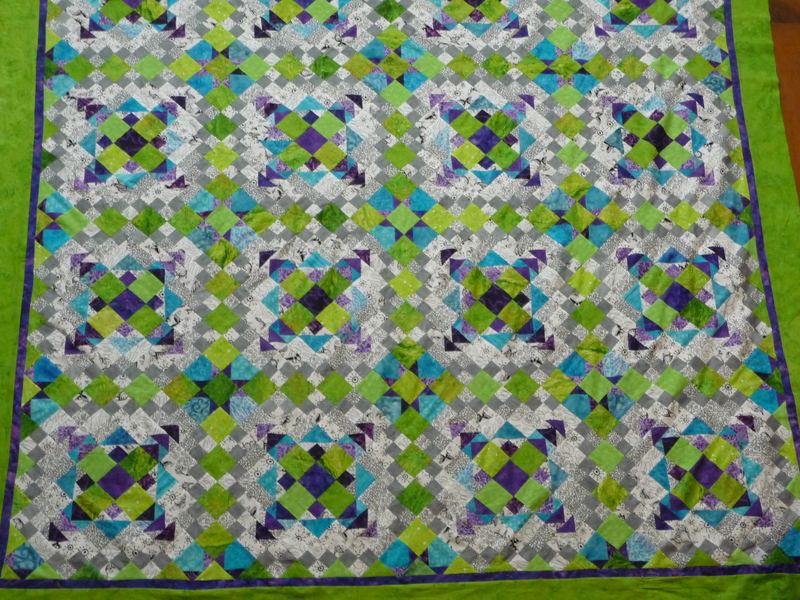 Meanwhile I finished the top to my Bonnie Hunter Quiltville Mystery quilt, Easy Street. I love the way it came out. It is currently on my longarm table very close to being finished. The pattern and fabrics are very busy so I am just doing some circles to give the quilt texture. I have already prepared my grey binding and will be ready to go with that when I finish quilting it. This is my first mystery quilt with Bonnie and I really enjoyed the process and love the quilt. Everything went together like bread and butter. Here is a picture of the top before I put it on the longarm to quilt it. No more quilting tomorrow. Have to get busy making drill team costumes for my daughters high school drill team. 😦 Until tomorrow…BE HAPPY! You have really been busy! Makes me a little embarrassed at how little I have done! That is beautiful Karen. It looks too complicated for me to do. There are lots of pieces but it is not hard, just requires lots of patience! It was very fun to do.